Speaker of the House Paul Ryan (R., Wis.) is calling for an immediate investigation into recent disclosures that the Obama administration censored public video of a State Department briefing about secret discussions with Iran, according to comments provided to the Washington Free Beacon. Ryan, a vocal critic of the administration’s diplomacy with Iran, accused the White House of misleading Congress and the American people about the nature of last summer’s comprehensive nuclear agreement. 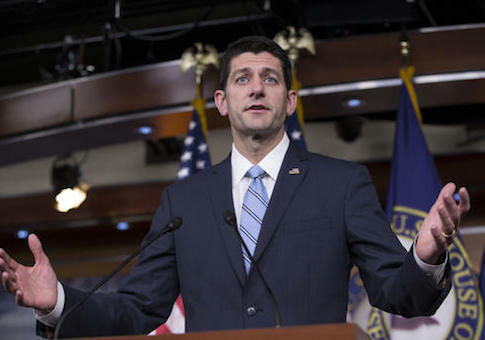 The disclosure on Wednesday that an unnamed State Department official ordered portions of a December 2013 press briefing about secret negotiations with Iran to be cut reinforces the need for full investigation into the administration’s deceptions surrounding the deal, Ryan said. "This admission proves once again that the White House intentionally misled the American people about the Iran deal," Ryan told the Free Beacon on Thursday. "If they truly care about transparency, the administration should investigate who requested this selective editing and why." State Department Spokesman John Kirby admitted on Wednesday that officials gave a direct order to delete portions of the briefing, which was conducted by former spokeswoman Jen Psaki and focused on the administration’s secret outreach to Iran early in the presidency. Kirby revealed "that a specific request was made to excise that portion of the briefing." However, he maintained that the administration does "not know who made the request to edit the video or why it was made." The administration will not conduct a further investigation into the matter, even though interviews with State Department officials could not determine why this information was withheld from the public. "The recipient of the call, who is one of the editors, does not remember anything other than that the caller was passing on a request from somewhere else in the bureau," Kirby told reporters. "I see little foundation for pressing forward with a formal investigation." The administration also will not make an attempt to determine the name of the official who gave the order to delete the briefing. Foreign policy experts who spoke to the Free Beacon speculated that the video might have been deleted to insulate Psaki, the State Department spokesperson at the time, from accusations that she deceived reporters about the administration’s diplomacy with Iran. One senior congressional source who has worked closely on the Iran nuclear issue accused the administration of trying to sweep this lie "under the rug." "The Obama administration was caught in a lie, and now they’re trying to sweep it under the rug," the source said. "Americans deserve to know who ordered this damning footage to be cut from the record." The administration’s behavior is consistent with other attempts to mislead congressional officials about the nature of the Iran deal. The White House has been engulfed in a growing scandal over efforts by senior National Security Council figure Ben Rhodes to create a pro-Iran propaganda effort inside the West Wing. The effort, which included outside nonprofit groups and prominent academics, was aimed at creating a so-called "echo chamber" to promote the Iran nuclear agreement. The senior congressional aide who spoke to the Free Beacon said that the administration continues to violate the law with its efforts to suppress information about the nuclear agreement. "This [behavior] should come as no surprise from an administration that repeatedly withheld critical information about the Iran deal from Congress, and even broke the law by failing to submit the secret side agreements," the source said. "The fact is this deal was sold to the American people on a lie that’s finally starting to unravel." This entry was posted in National Security and tagged Iran, Iran Nuclear Deal, Obama Administration, Paul Ryan. Bookmark the permalink.